David’s own recollections and anecdotes bring the book to life, giving it personality and making “Away Back!” so much more than a mere description of history. Having said that David describes the historical facts in great detail, considering that he has condensed 7 years into only 45 pages! 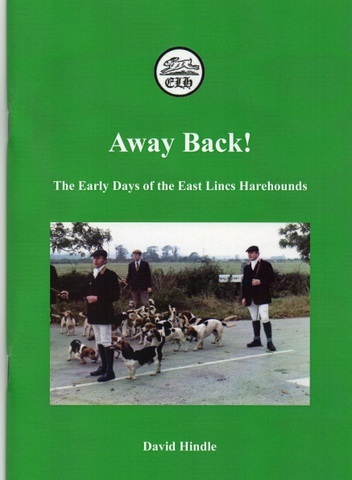 His accounts of hunt balls, puppy shows and other events alongside lists of meets, name checks for hunt staff and locations of kennels all paint a picture of life with the East Lincs in the 1970s. What is evident is that they enjoyed travel, visiting the Hunsley Beacon Beagles, Ireland and the Colne Valley Beagles during the period in question. Indeed the relationship with the Colne Valley was clearly a close one, with a joint meet being enjoyed in each country every season. The text is well illustrated with 17 photographs and a number of maps and a newspaper cutting, which help to give a flavour of what the East Lincs looked like. Apart from obvious changes to vehicles and the like I suspect the scene looked very much as it does today, with the hunt uniform having changed little since the mid-1970s. In short “Away Back!” is a beautifully written, concise history of one of the limited number of Basset Hound packs in the UK. It will be of undoubted interest to anyone interested in Basset Hounds, hunting in Lincolnshire or hunting history in general. I commend it to you. A limited number of copies are available priced at £7.00 (inc. p&p) from Alan Pickering (East Lincs Hon. Sec.) at agpservice@sky.com or on 07801 053 523.